Local Motion Studio is having an open house on Saturday April 13th from 11:30-1:30. All of the instructors will be there doing demos of: Zumba, Zumba Gold Toning, Kickboxing, Strength & Tone, Women's Self Defense, Tai Chi and Yoga. 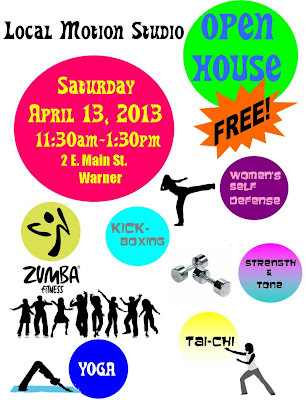 Come on by we'll have door prizes, free class vouchers, healthy snacks and of course FUN!! !